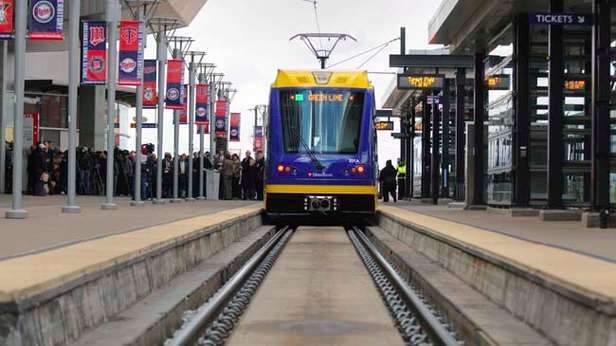 It won’t connect two cross-state cities, and it certainly isn’t “high-speed,” but a new light rail train line connecting the downtowns of Minneapolis and St. Paul has garnered attention, and also concerns over whether it can deliver promised benefits. Minnesota’s Metro Transit, which provides bus and light rail for the Twin Cities region, is about to open its new $957 million Central Corridor Green Line expansion for Minneapolis and St. Paul destinations. The project is said to attract billions in investment along the line and that 40,000 riders would use it every weekday by 2030. National transportation expert Randal O’Toole pointed out in a report published by the MacIver Institute that similar claims about the development impact of a streetcar project in Portland, OR were false. In reality, development along the route occurred only after Portland officials offered nearly a billion dollars in subsidies. Metro Transit officials initially claimed the 11 mile end to end trip would take 40 minutes, but recent route testing has revealed much longer trips. In early May, Minnesota Public Radio tracked nine test trains and came away with an average of 67 minutes for the trains to complete the 11 mile route. Metro Transit has been working in the past few weeks to close the time gap and have now put down 48 minutes as the official scheduled route time. The updated time comes without any official announcement on improved test runs. 48 minutes is still 15-20 minutes slower than an express bus that runs the same route. The Minneapolis Star Tribune reported that a local express bus will get you to and from the same destinations in 25-30 minutes. The distance can also be covered in 15 minutes by car in light traffic. Speed hasn’t been the only concern surrounding the project. On May 16, Rick Kupchella’s Bring Me the News revealed that a third collision with a car had happened in the third consecutive week during Central Corridor test runs. Nobody was injured during the crash, but the frequent traffic encounters demonstrate how congested the area already is. A Central Corridor test run was also derailed because of snow earlier this winter. Then there’s the money. Half of the $957 million budgeted for the light rail project are federal dollars with the rest being split up between state, regional, and local units. That’s a $478.5 million tab for Minnesota taxpayers just to get the line built. Expensive infrastructure projects subsidized by Washington tend to get expensive over time, as we warned during the “high-speed” rail debate here in Wisconsin. Former Wisconsin Gov. Jim Doyle, before he left office, attempted to move forward with a “high-speed” train project connecting Milwaukee and Madison so his successor would not be able to stop it. Speed and safety will be put to the test on June 14 when the new Central Corridor line opens. Only time will tell whether benefits outweigh costs for Minnesota taxpayers.